The 8th Generation Intel Core processors are raising the bar of desktop computing with innovations to drive incredible VR experiences, great gaming, and ultra-high definition entertainment. The 8th Generation Intel Core processors are raising the bar of desktop computing with innovations to drive incredible VR experiences, great gaming, and ultra-high definition entertainment. The 8th Generation Intel Core processors redefine mainstream desktop PC performance with up to six cores for more processing power — that’s two more cores than the previous generation Intel Core processor family. Thus highly threaded applications can get more work done in parallel, completing tasks sooner. Desktop PC performance is redefined with up to six cores for more processing power. Intel Hyper-Threading Technology delivers up to 12-way multitasking support. Intel Optane memory delivers amazing system responsiveness and Intel Turbo Boost 2.0 technology gives you that extra burst of performance for fluid gaming and smooth 4K video creation and sharing. 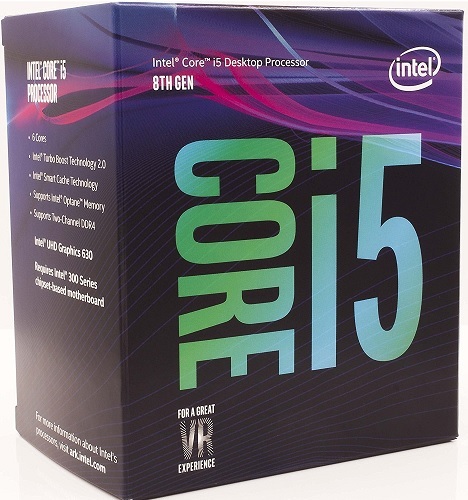 For the enthusiast, the unlocked 8th Gen Intel Core processors ('K' series only, whose model# ends with a 'K' suffix lettering) provide you the opportunity to tweak the platform performance to its fullest potential and enjoy great gaming and VR experiences. An impressive portfolio of standard and unlocked devices for a broad range of usages and performance levels provides you more control and more granularity for overclocking your platform.